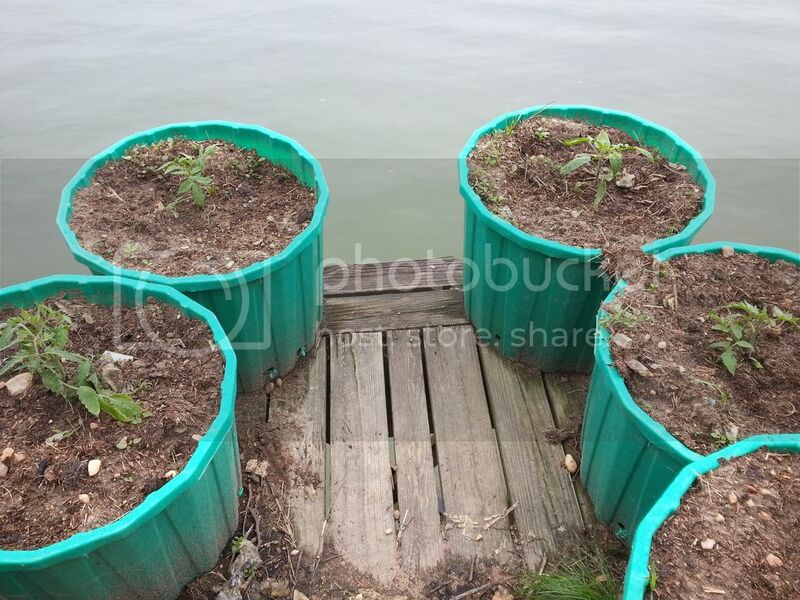 Several others are not in the containers on the pier and show that "Hey I really like this rich soil" color of green. 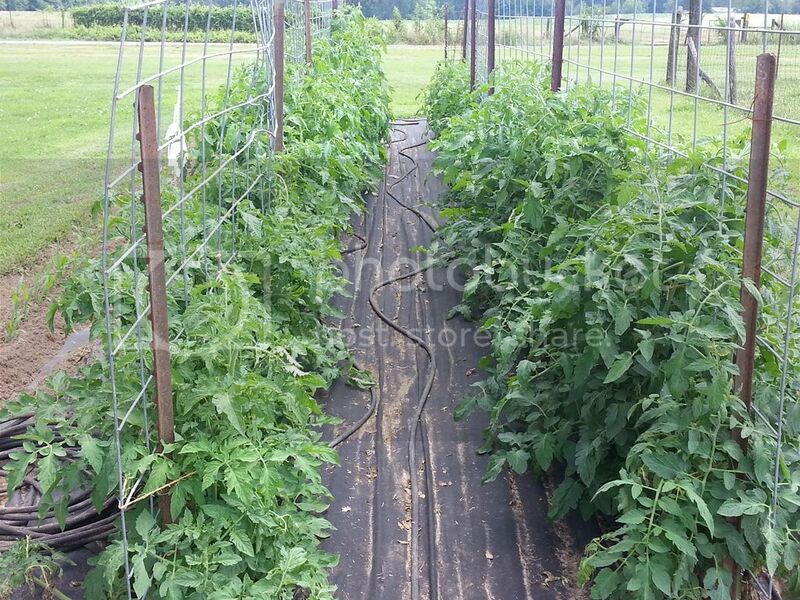 lakngulf wrote: What are your plans for tomato starts for 2015? What is your process--from seed to garden? These plants have been in an unheated hoop house through the daylight hours, lately. It's evening, so they are back in the heated greenhouse. It is now time to move some of these out of the 4-packs, 48 plants/flat, into 3 Â½" pots, 18 plants/flat. Rain in the morning with a temperature in the 30's (maybe a little snow with that rain ). It should be a good day for a little work in the greenhouse. 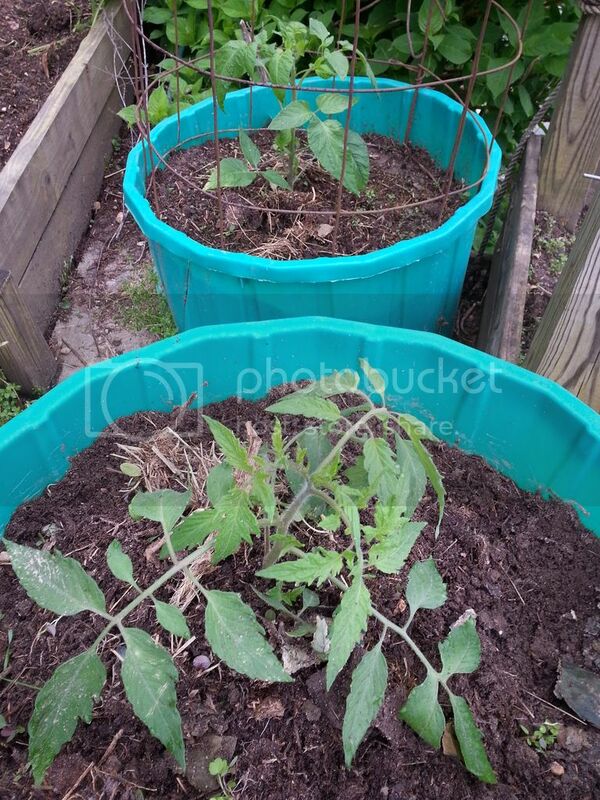 I finally have my three tomato tubs planted with beefsteak, which is already fruiting, red cherry (old reliable) and I kept one of the wild tomatoes in my third pot. I let the seeds soak in water for a day or two until i see a little green peaking out Them i place them between wet napkins. This way it will stay wet and sprout faster instead of having it try to break through the soil. Once it is a few millimeters, i start planting them in starters "soft' soil in a small green house to keep them warm! I have soaked some seeds before (mainly okra) but do not do so for tomatoes. I am sure the process works great, but so far my germination rate has been good. I fill the seed starting flat with potting soil, water it a bit and let sit. Then I gently push the small tomato seed into the soil with the point of a knife, water again and put under grow light. 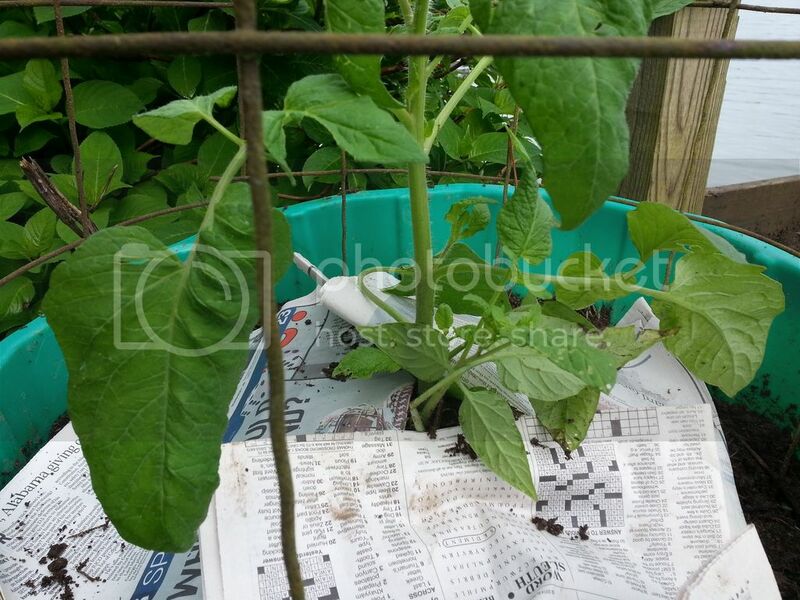 I soak 1Â½" to 2" of the soil mix in those community containers, thoroughly. It sits in a basin of water for about an hour then moves out to drip for a couple of hours, or overnight. Then, I line up seed right out of the packets on that wet soil mix. Dry potting soil goes over the top. The containers are then moved into the kitchen. The moisture in the containers is good for about 2 weeks. If I have problems with germination, I can usually blame the delay on old seed. Having both old and new in the same container can get me into trouble but that is my own fault ... so is crowding. 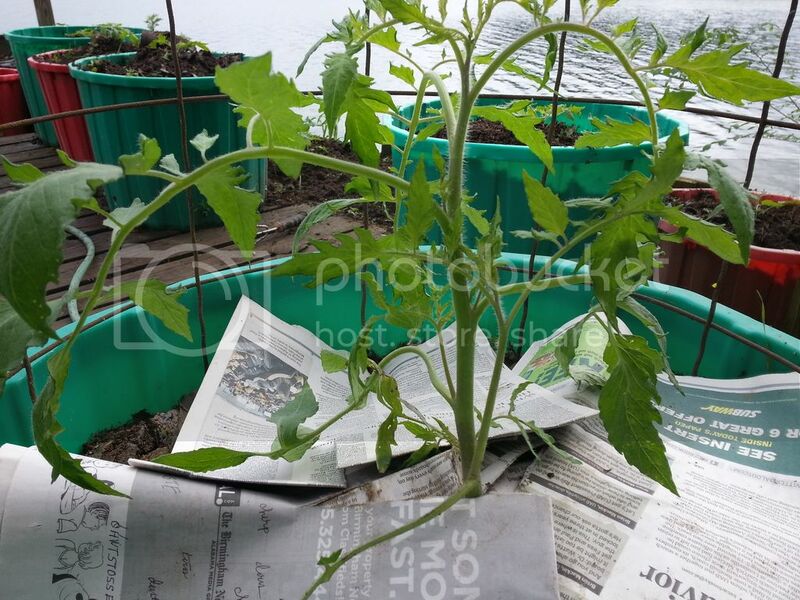 This year I hope to prune lower limbs/leaves of at least some of my tomato plants, hoping to avoid some issues caused by soil contact. What is the process? What should I prune? All lower limbs, or just suckers? Here are two plants that could be candidates for pruning. What should I remove? I remember going to Calloway Gardens with my parents and we were amazed at their tomato crop, running up on bailing twine. They had cut off everything about the plant except the main runner. 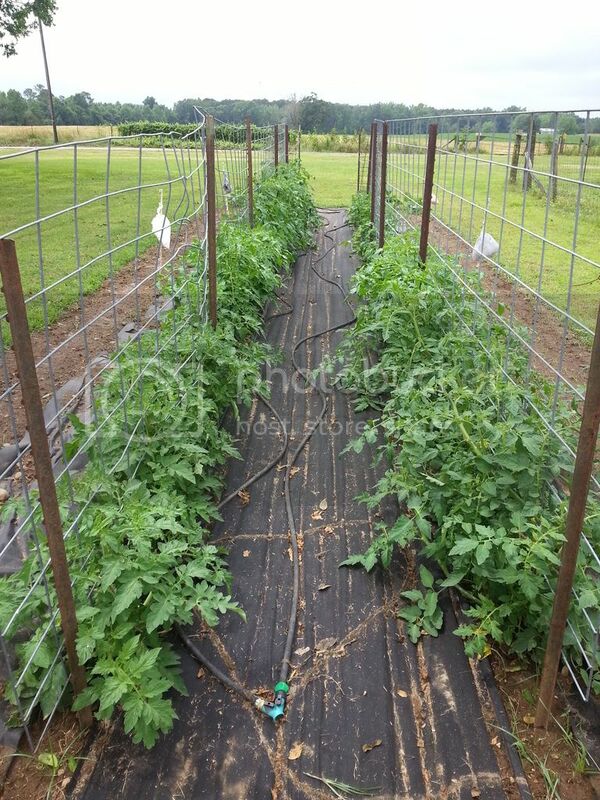 My Dad thought about doing the same thing, but as a cattle farmer with big hay crops, there was just not time to spend on pruning in the garden, especially when those plants were producing great tomatoes every year by just letting them grow full in cages. I have at LEAST 30+ good size tomatoes but it just has not gotten hot enough to turn them red yet. My tomato plant is taller than my corn right now. I had to put a bamboo stick in there because it was flopping over into my giant sunflower. At my Mom's house I planted 6-8 tomato plants each year, along with some pepper, cucumber, okra, eggplant and radish. She is 90 and still enjoys helping the plants along and seeing that they reach their potential in production. And I have some Better Boy and Fantastic for comparison. Looking forward to the results. Of those, I used to grow Fantastic each year and came to know it well. I like Gary O a lot. I was wondering if it does real well in my garden because of its hybrid vigor but how many generations must it be from the original cross - 10? 20? It came through some real bad windstorms last year with good vigor and real nice fruit! This year, the plants have blooms early. I won't have to worry that it won't have enough time to ripen fruit like happens so often with beefsteak varieties in my garden. Fantastic even had problems some years with ripening a crop. Your gardening environment must be just about the opposite of mine here in the Wild West. I'll be curious how Gary O comes through for you this season. digitS' wrote: Your gardening environment must be just about the opposite of mine here in the Wild West. I'll be curious how Gary O comes through for you this season. I will post some updates along the way. It is already interesting to see the growth characteristics and rate of each variety. The Lush Queen is the shortest but lots of full growth. The Gary O has a unique stem structure that is different from tomato I have grown. I have grown Brandwine for several years and like it a lot. Last year my favorites were Lush Queen and Amos Coli. My "home" tomatoes are doing well but seem not to be setting fruit very fast this year. I expect that to change. 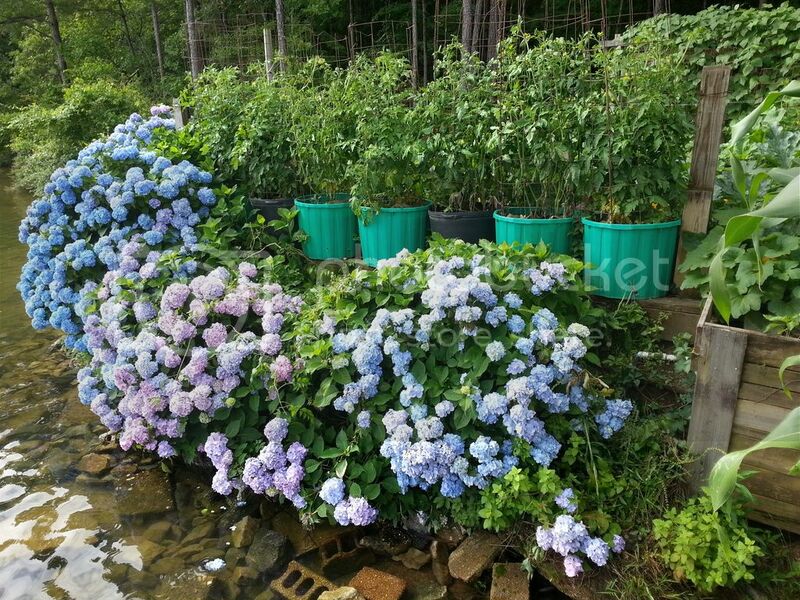 Also, I had to sneak in a picture of my hydrangea in full bloom on the bank beneath the garden. Well, aren't all the heirlooms sorta "crosses" of multiple? Will saved seeds from the Gary O be productive? and true? They have been for me, Lakngulf. Again this year, the plants are uniform and there have been no surprises. I may have had the soil too rich and the plants just decided to grow and not so much fruit. We do have some good temps now with full sun so maybe a lot of blooms will become nice tomatoes.